Want to convert WAV to MP3 and vice versa? WAVE (Waveform Audio File Format), better known as WAV and also called Audio for Windows, is a standard format used by Microsoft for saving and playing digital audio under Windows. This format is compatible with RIFF containers and is closely related to the 8SVX and AIFF formats used by Amiga and Macintosh computers. Formerly, it was a basic format for Windows and uncompressed audio. Uncompressed audio files have good sound quality but can be very large, and not all the media players, mobile phones, or other mobile devices can play files in this format. If you want to save space on your hard disk or listen to your favorite music on your iPod or Mac, it’s better to convert WAV files to the MP3 format. But how can you do this? 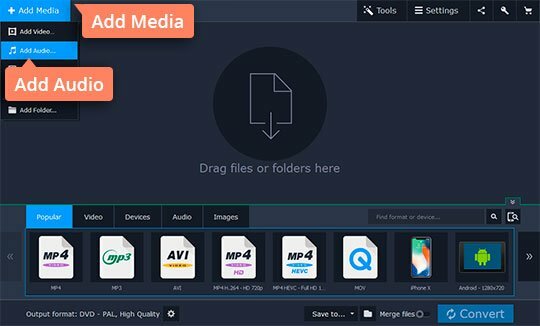 Movavi has the answer – use our all-in-one media converter. 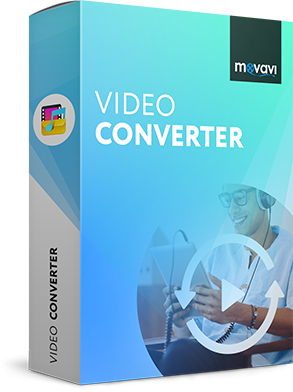 The Movavi converter supports 180 video and audio formats and also lets you save files for playing on more than 200 types of mobile device. With this handy tool, you can convert WAV to MP3 and vice versa in just five minutes! 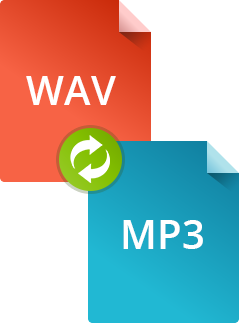 To convert from WAV to MP3, download the Movavi converter. This simple but powerful software can transfer music from WAV to MP3 or vice versa at high speed. 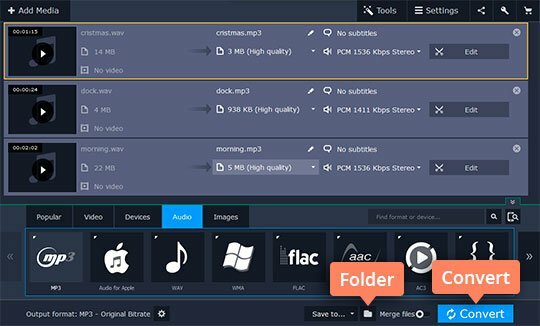 You can also use the program to extract soundtracks from films, clips, and ads. Launch the software, then go to Add Media > Add Audio in the converter interface. Choose the music files you want to change from WAV to MP3 or vice versa. You can convert a single file or batch process several files at once. In the Output format field, set MP3 or WAV, depending on your needs – you can turn WAV into MP3 just as easily as MP3 into WAV. You will find the MP3 presets under Audio > MP3. 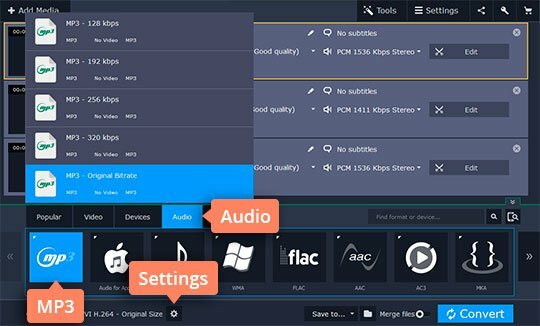 Here, you can choose the preset with your preferred bitrate, but remember that the higher the bitrate, the greater the quality and file size will be. You can also change a number of parameters, like the sample rate and bitrate, by clicking the Cogwheel icon. Choose the folder in which to save the output files: you can select the same folder as the original files in the Save to field, or you can specify an entirely different location by clicking the Folder icon. When you're ready, just click Convert to start the process. Converting MP3 to WAV or WAV to MP3 usually takes from one to ten minutes, depending on the size and number of files. When the conversion is complete, your new files in MP3 format will automatically be displayed in the selected destination folder. Now you know how to convert WAV to MP3 and vice versa. Converting music between formats is as easy as 1–2–3 with the Movavi converter!